I am spending a lot of time in the late 13th century at the moment, editing All the Winding World, the sequel to The Errant Hours. The story involves quite a lot of travel – local, regional and international. And this has brought me up against an anomaly in our thinking about the Middle Ages. Because we know that the people in Medieval Europe did not have planes, trains and automobiles, we are a bit guilty of assuming that they didn’t get out much. It is hard for us to imagine how people did business or pleasure on a more than local scale without the benefit of the internal combustion engine. 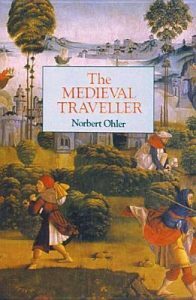 But Medieval people, and indeed all people in ‘the west’ up to the industrial revolution, genuinely did, as this fascinating book, The Medieval Traveller, has helped me find out. In our age, we dismiss the idea of walking long distances (or even quite short distances) because it might take too long, be too tiring, mean we have to carry a lot of stuff that might be heavy etc. I am as guilty of this as anyone. And of course it is rare to keep a horse, donkey, ox or mule. They are often difficult to park at the supermarket. Owning a boat or barge is equally rare. In fact owning horses and boats or ships is now seen almost exclusively as an elite and expensive hobby in the west. But in the Middle Ages travel, although often difficult and sometimes dangerous, was still common, and undertaken by every class of person. People went places to buy, to sell, to socialize, to find work, for special occasions, for religious purposes, for military purposes, for political purposes, and sometimes just because they wanted a change of scene. 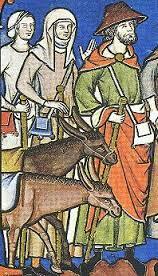 Horses helped, as did pack animals of many kinds. Water travel was often quicker than overland. And as now, the more money you had, the more comfortable you could be whilst travelling. But equally, the more tempting you were to robbers and outlaws. It would take much too long to detail the various routes, means and purposes of Medieval Travel. But if you are interested, The Medieval Traveller is a good companion on the journey to finding out. There is an illustration right at the end of this book that particularly struck me, for several reasons. It’s a woodcut from the 15th century, a bit later than the period I usually research, but it really struck a chord. Travelling folk on the road with all their household chattels. 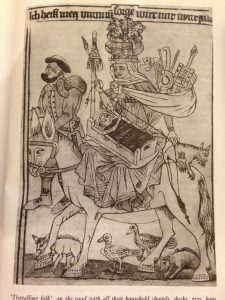 15th century German Woodcut. 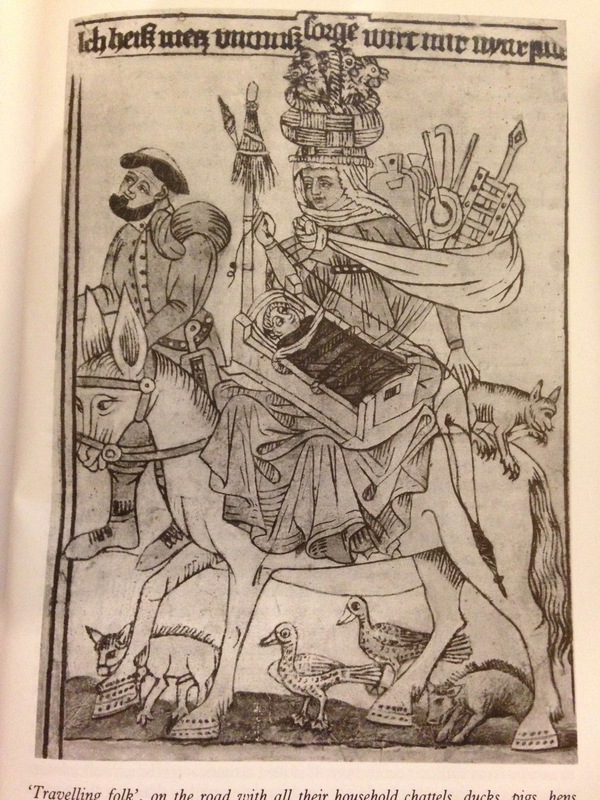 Here is the late medieval woman on her horse (or possibly mule), with her husband (probably) alongside her. She has a basket of chickens on her head, various household items, including a bellows, on her back. In her lap is a baby in a cradle, and she is spinning flax from her distaff onto her spindle as she goes. Her cat, ducks and pigs are all along for the ride (or walk). Where is this family going? We don’t know. 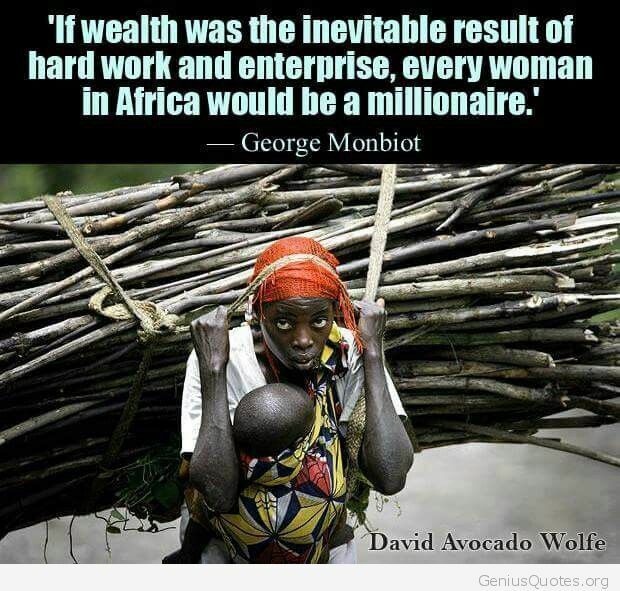 But we can see that the woman is multitasking like mad, as most women do, before, during and after a journey. Perhaps the picture is a bit exaggerated, but there is a significant truth behind it. It reminded me of something I saw about twenty-five years ago, when I was working at a rural secondary school in the Zambezi Valley in Zimbabwe. I was walking back to our house near the Catholic Mission with some other teachers, and coming towards us was a group of about four young African women. They all had loads on their heads. Heavy loads, which was nothing unusual. But one of them was really astonishing. She was about eight months pregnant. She had a pile of wood on her head. Not sticks or logs, but long, thick, big and heavy tree branches, tied into a large bundle. And as she walked along, she was knitting. She might have had a baby on her back as well, but I’m not sure about that. Certainly the other women in the group did. I have never lost my feeling of wonder at what she evidently took as a normal walk to get some wood. This was also the expectation for people in Medieval Europe. Merely feeding, warming and clothing a family was hard physical work. They would not see walking twenty miles a day carrying a pack as any particular hardship, as long as there was food and drink at the other end. And the inns, taverns, monasteries and hospitals that lined the major routes made sure there was – for a price, either worldly or spiritual. Perhaps for many, travel made a pleasant change from the drudgery of everyday chores. 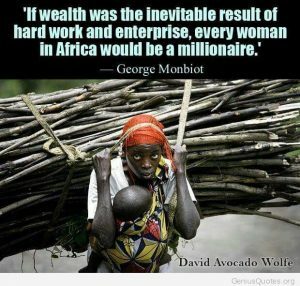 But we all know that wealth is linked with the control of resources, and not with sweat and hard graft. It was true in Medieval times, and it’s true today. I will explore this more in my next blog, which will focus on Rural Women, in response to an event with Pentabus Theatre that I’m lucky enough to be part of in February.